“The police came in hitting people with their batons,” said Eudes Payano, a member of the OWS en Español working group, who was present during the raid. 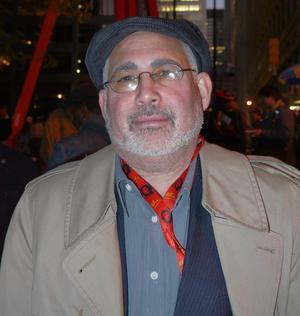 “Everything was confiscated.” Although he does not yet have an official list of the people who were detained in the raid, two of Payano’s companions from OWS en Español were arrested—Mario and Dani Rodríguez. The OWS movement is now deciding its next moves, and protestors are planning for the International Day of Action on November 17th. With a hoarse voice, from a long night defending the occupation from the police raid, Payano told NACLA, "the movement will continue and it will be even stronger." For nearly two months thousands of people gathered at Liberty Square to protest the role of Wall Street in the financial collapse and the increasing inequalities that afflict the United States. Under the motto, “we are the 99%,” the Occupy Wall Street movement has spread to over 100 cities in the United States and follows in the footsteps of actions in over 1,500 cities globally. However, there is one group that has gathered at the park since day three of the occupation, which has rarely received media coverage—“Occupy Wall Street en Español.” This group was formed by a group of Latino residents of New York who considered themselves victims of the financial crisis, which according to their mission statement has increased the impoverishment and social exclusion of their communities. 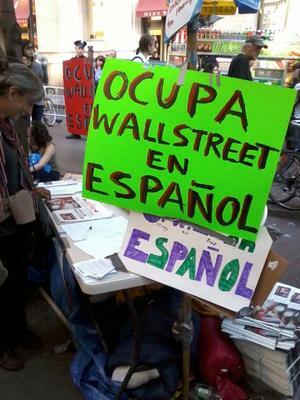 OWS en Español formed to stress that the Hispanic and Latino community is part of the 99%, and remind people that immigrants also need to be included when we talk about a more equal society. When I visited the OWS en Español table in late October, I talked to Eudes Payano, a native from the Dominican Republic who is part of the Committee of External Communication. This committee is in charge of handling any communication with the press or other external sources; it gives a voice, in Spanish, to the Occupy Wall Street movement. At the table there was even a Spanish version of the Occupy Wall Street Journal. Eudes Payano, 52, has a degree in anthropology from the Autonomous University of Santo Domingo. He immigrated to the United States several years ago, and earned an undergraduate degree in Criminal Justice, and a Master’s in Human Resources and Business Administration from the University of Florida. He lived in Florida until recently, but moved to NYC when he lost his job and his home, due to the real estate crisis. He is still unemployed. Why is the movement important to you as a Spanish speaker? It is important because the movement represents the desires and aspirations that I have as an individual and the collective interests of the vast majority of the 99% who do not possess society’s wealth; who are not the 1%. This movement is important because of the way it creates horizontal activism as opposed to traditionally vertical movements. For example, we usually have leaders who govern through a largely vertical hierarchy. Here we are creating a horizontal network to replace the traditional networks that exist in western culture. Our horizontality is the most important aspect of our movement because it gives the majority the ability to determine what it wants for the future. Eudes Payano (credit: Renata Pumarol) What is your story, and how does it relate to the 99%? First of all, I have an anti-capitalist perspective. I believe capitalism cannot resolve humanity’s problems. Capitalism has been the established economic system for more than 500 years. Nevertheless, it has not solved the many problems that humanity faces. Millions of people die in Africa and Latin America due to the immense social inequalities that exist in our society. Capitalism is an unjust and predatory system. How are Latino Immigrants part of the 99%? Above all, the United States is a country of immigrants. This especially goes for the New York City, which is home to more than 126 ethnic groups. Latinos constitute more than 50 million in the United States, according to the latest census figures. This shows that we are an emerging force. We contribute to the economic development of this country. Several university studies note that the Latino community, especially undocumented immigrants, is one of the groups that contributes the most, and that it is not a burden, but a benefit to economic development in the United States. Latinos are one of the ethnic groups with the least opportunities in relation to other groups. Latinos are relegated to an unequal category in education, jobs, and other areas of social participation. That is why I believe we have to face the problem of inequality, and precisely why it is necessary to legalize the 14–15 million undocumented workers who are currently living in the shadows. The same goes for the young people who cannot attend college, who are denied this right because they don’t have their immigration papers. What are the similarities between the movement to protest against inequity in the United States and other movements in Latin America, the Middle East, or Europe? The 1% of society controls all the wealth in the world. You can actually count the 10 families who control the whole world, who own the Wall Street banks. Today we do not talk about the wealth of the people, but the wealth of individuals. There are annual magazines that feature the most “fortunate” individuals—individuals, not the people as a whole. This indicates that there is inequality in the way in which the wealth of the planet is being managed. These very people who own the United States are the owners of the banks in Europe, in the Middle East, and in all corners of the globe. It is assumed that if capitalism as an economic system can be exported to any region in the world, then the working class, the class that produces that wealth, can also be supported anywhere. International movements are able to connect because they have the same complaints about the capitalistic system. Karl Marx advocated for the need to build an international working class to counter international capital. But the working class became regional. Horizontal movements are born because of a shortage of organizations that organize people’s discontent, as a response to the lack of an organization to encompass all this. Renata Pumarol is a social media intern at NACLA Report on the Americas. She holds a master's degree in Citizenship and Human Rights from the University of Barcelona and has contributed to Democracy Now! en Español and Barcelona’s independent radio show, Nómadas sin tópico.